Temporomandibular disorder (TMD) is a collective term that encompasses a set of clinical problems that affect the masticatory muscles, the temporomandibular joint, and associated structures. Despite their high clinical prevalence, the mechanisms of chronic craniofacial muscle pain are not yet well understood. Treatments for TMD pain relief and control should be minimally invasive, reversible, and conservative. Photobiomodulation (PBM) is a promising option once it is known to inhibit inflammatory response and to relief painful symptoms. Herein, the effects of PBM (660 nm, 30 mW, 16 J/cm2, 0.2 cm2, 15 s in a continuous frequency) on the pain sensitivity of rats submitted to an experimental model of TMD induced by CFA was evaluated. Experimental TMD was induced in rats by the injection of complete Freund’s adjuvant (CFA) injection into the masseter muscle. Nociceptive behavior was evaluated by electronic von Frey before CFA and after 1 h, 3 h, 6 h, and 24 h and 7, 14, and 21 days after PBM treatment. Inflammatory infiltrate was evaluated by histology of the masseter muscle and fractalkine expression was evaluated by immunohistochemistry of the trigeminal ganglia. PBM reversed the mechanical hypersensitivity of the animals by inhibiting the local inflammatory response, observed by the decrease of the inflammatory infiltrate in the masseter muscle of rats and by a central inhibition of fractalkine observed in the trigeminal ganglion. 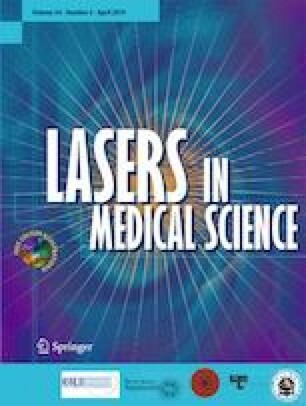 These data provide new insights into the mechanisms involved in the effects of photobiomodulation therapy emphasizing its therapeutic potential in the treatment of TMD. CSD thanks the National Council for Scientific and Technological Development (CNPq, Brazil) for the productivity fellowship. ACF thanks FAPESP for the PhD grant (FAPESP 2012/03865-0). ETS and EFT thank for CNPq grants. This work was supported by FAPESP (grant no. 2015/17136-8). The authors declare no conflicts of interest. Throughout the experiments, animals were managed using the principles and guidelines for the care of laboratory animals in studies involving pain and were approved by the Ethics Committee on the Use of Animals at University of São Paulo (CEUA, protocol no. 020/2014).